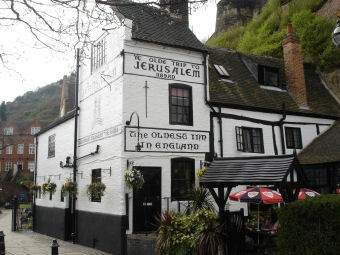 No trip to Nottingham would have been complete without a visit to the Olde Trip to Jerusalem. This was my first time in this pub and despite being crowded, there was still plenty of atmosphere. There are a number of characterful rooms on different levels. The one we were in reminded me of Gordon's Wine Bar in London, as it is tucked underground underneath Nottingham Castle. Despite being a Greene King pub, the ale range was quite decent - Greene King Abbot, Hardy & Hanson's Olde Trip, Nottingham Extra Pale, Legend & Rock Mild, Brewster's Grantham Gingerbread Brew, Beermats Diplomat, Howard Town Dark Peak & Lincoln Green Gin and Beer It. The cider was Bottle Kicking Cider Company Apple and Mango, whilst they also had Broadoak Perry. Despite being very touristy and very busy, this is still a place where you can have a decent conversation with strangers. A must visit. I have a soft spot for the Trip having been a student in Nottingham in the 70s. Despite the GK insigna outside still well worth a visit. Had a good pint of the resurgent Shipstones. Its a pity that the old pub game with the ring on a string has disappeared. A warren of a pub , full of character, and full of friendly locals who chatted to me from the off. The CAMRA discount was given pride of place on the first bar. The kiwi barman was rushed off his feet upstairs and apologised for the wait. He was interesting and entertaining, and had a good rapport with the locals.. I had a pint of Lincoln Green`s "Little John" 4.3% dark amber ale, which was excellent . I did n`t have the time to explore the rest of the pub, but hope to when I return. Took a work mate here for a look around as he had not been here before. I was not looking forward to a night of Greene King beers. But to our surprise they had a mini beer festival on, at the same time as the Camra Robin Hood festival in the castle above. Beer taps and stillage in the garden. I had Thornbridge Jaipur and very nice it was too. Barmaid was a bit frosty at first, she soon warmed up after she dropped a glass and it exploded into a thousand pieces and went everywhere. Fantastic pub and a must if your in nottingham. 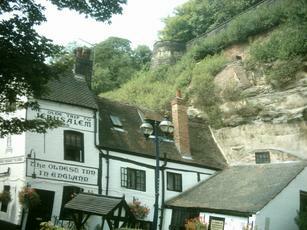 Its built into the surroundings and claims to be the oldest pub in england. A great choice of ales. Was very busy when we were there on a saturday afternoon. Bit of a labyrinth inside which adds to its character.